TIP: Before you get started with the batter, first you must mix the flours. ( Since Pillsbury GF has xanthan gum already in it you do not need to add it.) In a large bowl add 2 boxes of Betty Crocker Gluten Free Rice Flour Blend ( it comes in 1 lb. boxes) and a 2 lb. package of Pillsbury Gluten Free Flour. Slowly whisk together until thoroughly blended. Store in an air tight container and label. When you are ready to bake. In the food processor mix the rest of the ingredients. Making sure all dry ingredients are mixed well, add the wet ingredients from the refrigerator. Blend well until there are no lumps left. Using a triggered ice cream scoop fill cups for cupcakes. Bake for 25 -30 minutes. Makes about 18 cupcakes. 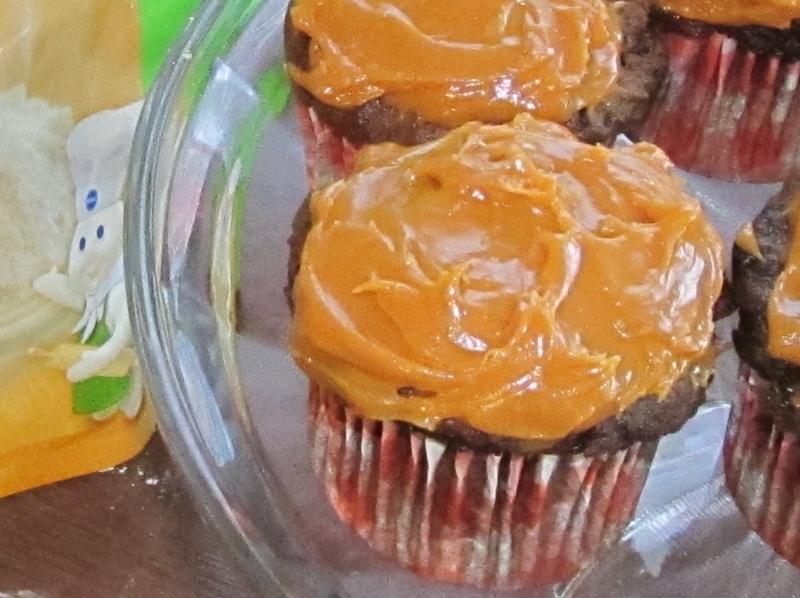 When cool, ice with caramel icing. 1 – 14 oz. Can Sweetened Condensed Milk ( make sure there are no additives, ingredients should read, Milk and Sugar) For Dairy Free you can substitute Coconut Cream. Open can and pour into a large glass bowl. Unwrap all caramels and add to canned milk. Heat in microwave for about 1 minute 30 seconds. Stir will and reheat until all caramels are melted, about another 1 – 2 minutes. You can ice cupcakes while icing is still warm or you can wait and let it cool and thicken, so that you can swirl it around the cupcakes.